Laser vision correction clinic in Lithuania – unbeatable value for money! We perform operations using the latest medical equipment; hence we are the Lithuanian Representative Centre for the renowned German medical equipment manufacturers Carl Zeiss Meditec. We are continually expanding the range of services that we offer and through successful investment we have formed a team of highly-skilled specialists. Our values of safety, minimal surgery and close long-term relations have helped us to win our patients’ confidence. Our international standard of clinical practice has been recognised abroad, as seen in our membership of the Chambers of Commerce of Germany, Norway, Denmark, Sweden and Finland. We truly hope your vision is excellent … but if it’s causing you concern – we are pleased to assist. Vision correction by laser – a safe and effective procedure. Significant scientific discoveries have changed the ways in which eye diseases are diagnosed and treated, and have given people with vision problems an excellent alternative to glasses or contact lenses, namely – vision correction by laser. Myopia up to (-) 8D, hyperopia up to (+) 3D, astigmatism up to 3 D.
If the cornea is not too thin: The thickness of the cornea before the operation must be not less than 500 microns. If the patient has no illnesses: The procedure is not recommended for those suffering from systemic diseases, auto-immune diseases, diseases of the connective tissue, allergic diseases or diabetes mellitus or for expectant or breast-feeding mothers. The correction method recommended and most often used by the Clinic’s surgeons is LASEK. This method is the safest and does not cause undesirable post-operative effects. Operations conducted by this method prevent the risk of complications from the formation of patches on the cornea. No incision is made in the cornea so it is not weakened and its integrity is maintained. Since this method does not damage the inner layers of the cornea, the eyes do not become more sensitive after surgery and patients do not complain about dryness of the eyes. The patient may choose to have the operation performed by other methods, such as LASIK or PRK. Operations are performed with the new generation Meditec eximeric laser MEL 80 from the German firm Carl Zeiss. In the pre-operative examinations, we use highly accurate diagnostic equipment from Germany, Japan and USA. In the modernly equipped operating theatre the patient is made to feel comfortable in a lying position and a local anaesthetic is applied by means of anaesthetic eye drops. The operation lasts for about 20 minutes, during which the upper part of the cornea is treated by a laser which effects a change in the cornea’s convexity and its refractory power. Light rays that pass through the eye’s optic system start to focus in the retina and in this way vision improves. Immediately after the operation the patient receives the doctor’s instructions and recommendations together with prescribed eye drops. In addition the patient is given the telephone number on which he/she can contact the doctor, and then the patient is fit to go home. Depending on the method used in the operation, the post-operation examination is carried out on the first or fourth day after the operation. Over 1,000 vision correction operations are done at the Clinic every year. Before the operation, tests are performed to enable a very precise assessment of the patient’s vision. 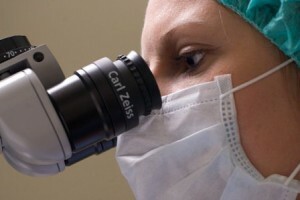 Each eye is analysed by front segment tomography (Pentacam) and a topography of the cornea is conducted. Likewise, a measurement of the eye parameters (IOL master) and an assessment of the optic system (Wavefront) is concluded. If necessary, an OCT test of the retina is done, this enables the detection of even the smallest changes in the fundus of the eye. After these tests the laser vision correction operation can be decided upon and safely planned. The operation is only performed once an assessment has been made regarding whether the result of the operation will meet the patient’s and the surgeon’s expectations. The doctor and the patient will, prior to surgery, discuss the pros and cons and decide upon the most appropriate method of correction.